You’re listening to CME on ReachMD! This activity, titled Adnexal Mass Management: Risk Stratification and Management Practices for Best Patient Outcomes is provided in partnership with Omnia Education and supported by an educational grant from Vermillion, Inc.
disclosure statements, as well as the learning objectives. Your host is Dr. Renée Allen. Ovarian cancer is the 11th leading cause of cancer and yet, it’s the 5th leading cause of cancer-related deaths in women. Early detection is among our greatest challenges and a key factor to maximizing remission. This is CME on ReachMD, and I am Dr. Renée Allen. Joining me today is Dr. Burton Brodsky, Director of Minimally Invasive Surgery, Section Chief of Gynecological Services, and Assistant Clinical Professor at the University of Toledo. During this program, we’ll compare the clinical outcomes and practice management implications for current tests designed to assess the risk of malignancy in adnexal masses and to form treatment plans. Dr. Brodsky, thank you for being with us today. Dr. Brodsky, let’s start with some basics. 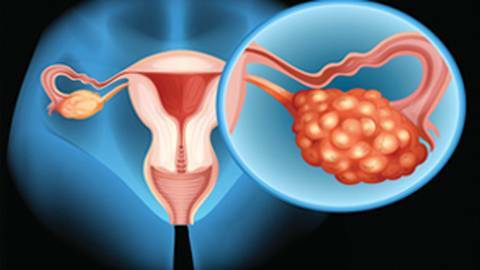 Three-quarters of ovarian cancer patients are diagnosed in late stages. What are the challenges associated with early detection of ovarian cancer and non-cancerous conditions? Well, I think some of the biggest challenges we have are related to symptoms and clinical diagnostic. The symptoms are very nonspecific. Most of them are detected incidentally on pelvic exam at the time of imaging, such as bloating, indigestion, increase in abdominal girth, change in bowel habits, tiredness. So I think the biggest thing in looking at risk factors, you have to look at independent risk factors, like age, and then the number one personal risk factor which is family history I think they’re underestimated a ton. family history is not taken seriously as much as it should, and that’s probably the biggest risk factor that we see. Other risk factors we worry about are patients’ nulliparous, early menarche, late menopause, Caucasian, infertility, and endometriosis, and you have to remember that OB/GYNs see ovarian cancer about once every 2 years. this has the highest mortality of any GYN cancer, and with the difficulty in diagnostics, and pelvic exam is very difficult as well, due to patients with obesity and fibroids, it makes it for us, as clinicians, a lot harder to diagnose. There are risk-assessment tools which could be used, that certainly could be of value to clinicians as well. Okay. Dr. Brodsky, you brought up these risk assessment tools. So can you go into a little bit more detail as to what exactly are these tools that can be used and are there any new options for clinicians at all? Sure. Well, the most common assessment tool that’s used is pelvic ultrasound. And on pelvic ultrasound, we want to distinguish whether it’s a benign or a malignant pelvic mass. for malignancy, we want to make sure if it’s a solid tumor, if it has ascites, papillations, excrescences, if it’s multilocular, if it’s greater than 10 cm, or if it has a high color Doppler score. The problem with that is that’s not as sensitive as well and a lot of people use a CA-125. people have to remember that CA-125 is only FDA approved for monitoring disease progression and response to therapy. It is not a screening test. It can be used in a lot of different things for monitoring disease and response to therapy, but it has a low sensitivity in premenopausal patients, low sensitivity in early-stage cancers, and it’s limited to certain histologic subtypes such as it’s not expressed in mucinous, clear cell, undifferentiated, sarcoma, and there’s a lot of things that cause false-positives with it as well. So we look at other things, other biomarkers which are commonly used like a CEA. There’s LDH, beta-HCG, and AFP as well. HE4 was also approved in 2008 for monitoring women with a history of ovarian cancer. , the two that are approved by the FDA are the Risk of Ovarian Malignancy Algorithm, the ROMA, or the Multivariate Index Assay, which is the OVA1. , these are used for patients with a pelvic mass, which is key. the big benefit of the OVA1 is the negative predictive value,. They look at five different things. The beta microglobulin, the CA-125-II, the apolipoprotein A1, pre-albumin, and transferrin, and then it gives you data score based on that. The benefits outside of the negative predictive value, is it looks at multiple subtypes such as mucinous, carcinosarcoma, endometroid, it can even look at other non-GYN cancers. So looking at CA-125, I think we talked earlier that it was one of the more abused tests that we use, and the main benefit of that, like we talked about, was just monitoring disease progression or response to therapy. Looking at OVA1, in contrast with the CA-125, looking at all cancers and specifically look at epithelial cancers, if you look at the pickup rate for that, or earlier stage cancer, premenopausal women with early stage versus postmenopausal women, the sensitivity is much higher with OVA1 as well as the negative predictive value. OVA1 detected about 76% of malignancies that would be missed by CA-125. I think a lot of that comes through the misuse of the CA-125, used by a lot of internists, family practitioners, and GYNs tend to be the highest abusers overall. So looking at that, 70% of GYNs and 95% even of GYN oncologists will be missed on physical assessment alone, and that’s why use other tools that have been approved, again by the FDA, so we can look at these and assess the risk of ovarian cancer with pelvic masses. Going through the Risk of Ovarian Malignancy Algorithm, which is what ROMA is, it was FDA-approved in September 2011. And that was indicated for woman, again, with a pelvic mass, and I think that has to be clearly stated. These are used for patients who have an adnexal mass and that are planned for surgery. It’s certainly not a screening test; not a stand-alone test. So what ROMA does, it combines the use of HE4, which we talked a little bit about earlier, and the CA-125-II. It also takes into account menopausal status and gives you a numerical score. So looking at that, it has a high sensitivity for epithelial ovarian cancers and low-malignant potential tumors. So the benefit of this along with the OVA1 is looking after patients with adnexal masses, and assessing if they’re getting the best care, and what their risk for malignancy would be. And the key to this whole thing is you want to identify patients with adnexal masses and make sure they’re getting the best care. Make sure they’re in the hands of the right surgeon, who is doing the appropriate care. And that should always be our bottom line with this. All right. Well Dr. Brodsky, could you expand a little bit more about OVA1? I’m sure that the listeners would want to know a little bit more about this particular test because this seems to be a newer test than the other risk assessment tools that you discussed earlier? we’re doing evidence-based medicine these days, and to look at that, you have to look at the ACOG criteria. in a pelvic mass detected on ultrasound, if you look at the level A data, they look at three different things: whether it’s clearly benign, it’s uncertain, or it’s clearly malignant. So if we start with something that’s clearly benign and you see a normal cyst, it’s simple in appearance, thin walls, there’s no solid papillations, excrescences, less than 10 cm, we know the risk of cancer is very low. A lot of those patients can just have expectant management, management symptoms, as well as follow up. And then, if it’s clearly malignant as well, we have a cyst that’s greater than 10 cm, multiple septations, papillations, solid component, ascites, high color Doppler, those patients where we’re certain it’s clearly malignant, I say certain, has a higher instance of being malignant, we want to make sure those patients are in the right hands and those patients will be referred to a GYN oncologist. And I would do that as soon as possible. The bigger picture comes in that’s not clear. we see ultrasounds that are 3 to 10 cm, they’re not thin-walled, you may see greater than one septation, you may see a small nodule, and it’s not a clear picture. That’s where OVA1 has its biggest impact, because you can get a clearer picture of how to manage this adnexal mass. ACOG states that pretty clearly. it’s good for anyone with cancer, premenopausal patient, postmenopausal women, for a cut-off. this will give you more information to say whether you need to refer this patient to a GYN oncologist or we could treat this patient on our own. And the benefit of this, there’s no need to refer to a GYN oncologist, it removes the need for additional testing or imaging that might be done at another cost for the patient. And again, it’s where the patient is most comfortable, we can do the most minimally invasive job for the patient giving the patient the best outcome is the most important thing, to make sure the patient’s getting the right treatment. ACOG says you should consult with or refer to a GYN oncologist if a patient has an adnexal mass and there are certain criteria. And one of the criteria is premenopausal or postmenopausal women with an elevated score on a formal risk assessment and they say, such as OVA1 or the Multivariate Index Assay. SGO, the Society of Gynecologic Oncology, says tests monitoring blood levels with 5 proteins, which again is the Multivariate Index Assay, may be useful in identifying women’s ovarian mass who should be referred to a GYN oncologist, and the National Comprehensive Cancer Network who makes the guidelines for a lot of the ovarian cancer related to hereditary cancers as well as ovarian cancer, again, states a very similar thing. It’s just trying to find a surgeon, who should undergo surgery by an experienced gynecologist, who then can have surgery in the community, and still provide the best management. If you’re just joining us today, this is CME on ReachMD and I am Dr. Renée Allen. And today, it’s my pleasure to have Dr. Brodsky to discuss risk assessment methods for ovarian cancer. Dr. Brodsky, earlier you just told us that the information gathered from risk assessment tools, such as OVA1, can help inform management decisions for patients with suspected ovarian malignancy. Can you go into a little bit more detail to tell us more about this? Sure. The whole goal for a patient is to make sure they’re getting the best care and the best outcome. One of the big goals we have is providing evidence-based medicine and educating our patients on the risks, benefits, alternatives. So the further we can evaluate adnexal masses and find out if they’re higher risk, moderate-to-high risk, and whether that these cases can be done in a facility that may not have a GYN oncologist and may have someone who needs staging and appropriate care or chemotherapy or radiation, to find out whether a patient can or can’t have that surgery. And there’s good data to say if it’s not staged by a GYN oncologist, by just a general OB/GYN, or a general surgeon, that staging is different, and outcome is different as well. with OVA1, we can assess whether patients have a higher risk and should be referred to a GYN oncologist. And the negative predictive value, as I stated earlier, is the key to that. You can’t illuminate, you can’t make sure that it’s 0% chance, but it’s low enough that we’re obviously going to get surprises during surgery. Okay. Well, you discussed the fact that patients who have a suspicious mass should be referred to a GYN oncologist. Can you discuss a little bit more about the Goodrich graph, what exactly that entails and how that can help with risk assessment? the Goodrich graph give you an OVA1 score depending on if the patient’s premenopausal or postmenopausal, it will actually calculate the risk of malignancy in these patients. it’ll actually put the patients on a score, and we can look at high-risk postmenopausal patients, low-risk postmenopausal patients, and obviously high-risk premenopausal and low-risk premenopausal patients. we know that age is a big risk factor for ovarian cancer so those are different between a postmenopausal status and the premenopausal status, and then we can assess the best care for this patient, give them the best information, so obviously they get the best outcomes. Dr. Brodsky, now let’s turn to the implications for practice management. These complicated tests that you just discussed can be quite costly. Are there processes in place to reduce costs or payment barriers for patients, and how can our clinicians work through these issues? Well, if I give you the simple answer I would say “yes.” Can these be costly? Yes. we have to look overall and say, “What is the best thing for this patient.” We always have to look at the cost and benefit in our care and obviously the cost to the patient. If I look at hereditary cancer testing, which has been available since 1998, a lot of physicians have barriers to that because they’re worried about high cost to our patients. If we’re really concerned about our patients and their care, there is so much advocacy for these patients for tools, for patient counseling, for again, payment options, and overall these are not nearly as high as most people think. And if I look at related to hereditary cancer testing, , and specifically for OVA1, 95% of patients can have their testing done and that’s very similar to other tests such as BRCA analysis. Looking at that, that “yes” there’s a way that we can do this. And what we’re doing is we’re educating, empowering patients, so they can have information done for them and their health. if you ask patients, do we get a better outcome, there’s something you could do for these patients that would improve their survival for them, as well as their family in some cases then it becomes a no-brainer. What about the self-pay patient? Can you discuss a little bit more about the options those patients have for these risk assessment tests? Absolutely. There’s a lot of Federal-funded programs, for, noninsured or under-insured patients, speaking about hereditary cancer, there’s multiple cases that have been done for free There’s many states that have specific programs. I think that what you’ve been discussing is very exciting news for the evaluation and testing for ovarian cancer. So before we wrap up, Dr. Brodsky, are there any further takeaway points that you’d like to add or reiterate for our listening audience? Sure. I think the big thing for me is ovarian cancer is still a huge dilemma for us. It’s a diagnostic dilemma for us because we don’t pick up cases until they’re later. Most cases, are Stage III and Stage IV. as clinicians we have to have a higher suspicion and we have to look at family history. We have to look at other risk factors as well,, including age , so we can find these patients earlier. if we get earlier detection, then we can refer these patients to GYN oncologists, and this will improve outcome, improve survival, and be more cost effective as well. using certain tools such as OVA1 can help stratify your patient’s risk, so we can pick up whether they need to have surgery done by a generalist or by a GYN oncologist, and again, improving survival, cost as well. overall we’d like to decrease ovarian cancers since it’s the number one killer that we see from GYN malignancies, and improve survival as well as with families. Well with that, I’d like to thank my guest Dr. Burton Brodsky for sharing these insights on early detection of ovarian cancer. Dr. Brodsky, it’s been great having you on the program. Thank you so much. This was CME on ReachMD. The preceding activity was provided in partnership with Omnia Education. For more information or to receive your free CME credit, go to ReachMD.com/Omnia. Women's health experts review clinical outcomes and practice management implications of risk assessment methods for ovarian cancer. Low awareness of women’s risk factors and symptoms for ovarian cancer, compounded by common use of diagnostic laboratory tests that are less sensitive and not specifically approved for assessing the risk of malignant adnexal mass, are the most important reasons that the great majority of women with ovarian cancer are only diagnosed in late stage disease, when prognosis is far worse. In this CME activity, join Dr. Burton Brodsky as he reviews best practices in malignancy risk assessment of adnexal mass to improve the detection of ovarian cancer in pre and postmenopausal women in earlier stages, ultimately enhancing their chances at surviving this devastating condition. Additionally, we will share practical strategies to best inform and empower patients, as well as practice management implications to facilitate patients and clinicians’ access to guideline recommended tools for ovarian cancer risk stratification. Dr. Allen receives a salary from Mednax LLC, consulting fees from Ferring Pharmaceuticals, and is a speaker for Quest Diagnostics. Dr. Brodsky receives consulting fees from Myriad Genetics and Vermillion, Inc.
Summarize practice management strategies that will facilitate mutual access for both patients and physicians to complex ovarian cancer risk assessment tools. This activity is designed to meet the educational needs of Obstetricians, Gynecologists, Gynecologic Oncologists and Primary Care. This activity is supported by an independent educational grant from Vermillion, Inc.